El Papa Francisco saluda al P. Gustavo Gutiérrez por sus 90 años, a través de una carta en la que le expresa su gratitud por haber contribuido a la Iglesia y a la humanidad, a través de su servicio teológico y de su amor preferencial por los pobres y los descartados de la sociedad. “Me uno a tu acción de gracias a Dios y también a ti te agradezco por cuanto has contribuido a la Iglesia y a la humanidad, a través de tu servicio teológico y de tu amor preferencial por los pobres y los descartados de la sociedad”, lo escribe el Papa Francisco en una carta de saludo enviada al P. Gustavo Gutiérrez Merino, O.P., con motivo de su 90 cumpleaños, los cuales cumplirá este 8 de junio. En la misiva – fechada el pasado 29 de mayo – el Santo Padre saluda al religioso peruano y le asegura su oración en este momento significativo de su vida. “Me uno a tu acción de gracias a Dios – afirma el Papa – y también a ti te agradezco por cuanto has contribuido a la Iglesia y a la humanidad, a través de tu servicio teológico y de tu amor preferencial por los pobres y los descartados de la sociedad”. Asimismo, el Obispo de Roma, agradece al teólogo peruano, “por todos los esfuerzos y por tu forma de interpelar la conciencia de cada uno – precisa el Pontífice – para que nadie quede indiferente ante el drama de la pobreza y la exclusión”. 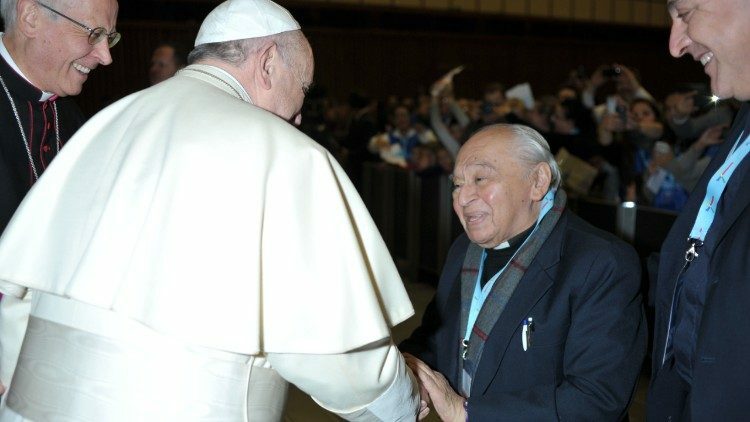 El Papa Francisco concluye sus saludos animando a Gustavo Gutiérrez “a que siga con su oración y su servicio a los demás, dando testimonio de la alegría del Evangelio”. Gustavo Gutiérrez Merino, nació el 8 de junio de 1928 en Lima, en el seno de una familia humilde con orígenes nativos y quechuas. Estudió Medicina, pero su vocación para ser sacerdote lo llevó a estudiar Filosofía y Psicología en la Universidad de Lovaina (Bélgica) y Teología en Lyon (Francia), llegando a ordenarse en 1959. En los años 60, abordó una nueva interpretación de la teología en relación a la problemática de la injusta estructura social en América Latina, por lo que la pobreza se vuelve un eje importante de su reflexión teológica. Categorías: Diálogo, Teólogo | Tags: Gustavo Gutiérrez, Papa Francisco | Enlace permanente. Las críticas de algunos teólogos al Papa Francisco. Análisis de Thomas Reese, S.J. Scripture tells us that they will know that we are Christians by our love (John 13:35), but the media tell us that they will know that we are Catholics by our fights. There have been lots of fights in the Catholic Church lately as reactionary cardinals, theologians and commentators have gone after Pope Francis and his emphasis on God’s compassion and mercy. These dissenters believe that he should stress the rules and divine judgment. Our weekly podcast takes an in-depth look at the week’s news. Sign up for email notifications when new episodes publish. What is remarkable about these critics of Francis is that many were papal loyalists during the papacies of Pope John Paul II and Pope Benedict XVI. During these papacies, they harshly criticized as dissidents and heretics anyone who questioned papal teaching. What is clear now is that their loyalty was not to the successor of St. Peter but to their own theological opinions. No one epitomizes this transformation more than Capuchin Fr. Thomas Weinandy, who recently released his letter to the pope accusing him of confusing the faithful. Weinandy was executive director of the U.S. bishops’ Secretariat for Doctrine from 2005-2013 and used his office like a grand inquisitor to persecute those theologians who questioned papal teaching. True, he did not physically torture his victims, but he did everything he could to destroy their reputations and their careers. To my knowledge, none of these theologians had the chutzpah to write a letter to the pope and then release it to the press. Rather, they wrote as academics on topics in the areas of their expertise. Most of them were highly respected in their fields. Now the inquisitor is questioning the pope. Weinandy and his friends may be confused, but the faithful at large love and support Francis. A Pew Research Center survey released in January found that 87 percent of Catholics express a favorable view of Francis. It should be noted that these Catholics also liked John Paul and Benedict, but unlike the conservative dissidents, they did not abandon the papacy when Francis was elected. He even asserts that this “seemingly intentional lack of clarity inevitably risks sinning against the Holy Spirit, the Spirit of truth.” He accuses the pope of “calumny” in calling his critics “Pharisaic stone-throwers who embody a merciless rigorism.” This coming from a man who did not worry about calumny when he was accusing some of America’s most prominent theologians of being unorthodox! Weinandy ignores that fact that “Amoris Laetitia” was the product of wide consultation in the church, including two synods of bishops. There is no question that Francis gives a priority to how we live the faith rather than how we explain it, or as theologians would say, he gives more importance to orthopraxis than orthodoxy. As Matthew 25 explains, we will be judged by how we live the faith in feeding the hungry, giving drink to the thirsty and clothing the naked. We will not be judged by whether we can answer all our catechism questions. Weinandy appears to confuse the faith with theology or how we explain the faith. Many in the church, in response to the Reformation, equated the faith with everything in the catechism. Rather, theology is always an imperfect attempt to explain the faith, which is a mystery. Theology is simply an attempt to explain the faith using the best thinking of the day. Augustine used Neoplatonism; Thomas Aquinas used Aristotelianism. What Weinandy and his inquisitional colleagues never understood is that it is the job of theologians not simply to quote Augustine and Aquinas, but to imitate them by using the best thinking of their day to explain the faith to their generation. One cannot use 13th century theology to explain the faith to people in the 21st century. The suppression of theological creativity during the papacies of John Paul and Benedict hurt the church badly. Weinandy’s third complaint is that the pope is scandalizing the believers by appointing bishops “who seem not merely open to those who hold views counter to Christian belief but who support and even defend them.” Again, Weinandy confuses the faith with his theology. He is shocked that a pope would appoint men who reflect his priorities for the church when this has been done by every pope. Under John Paul, loyalty was the most important criterion for episcopal appointments, trumping pastoral qualifications and good judgment. In reality, collegiality and synodality are trying to explain the same reality — the union of the pope with the college of bishops where there is shared responsibility for the church under the primacy of the pope. Sadly, collegiality under John Paul became defined as the obligation of the bishops to agree with him in all things. Synods became a joke, where bishops quoted the pope to himself and told him how great he was. Francis, on the other hand, encourages free discussion and debate, which he sees as the path to theological and pastoral development. Ironically, Weinandy complains about the pope allowing too much freedom of discussion and then takes advantage of this freedom to tell the pope that he is all wrong. Again, Weinandy appears to have forgotten the fear inspired in bishops and theologians by John Paul, who would allow no discussion on issues on which he had made up his mind. Weinandy has also conveniently forgotten his own role in this inquisition. So far, he can provide no evidence of similar actions against him and his colleagues by Francis. In brief, Weinandy fails to see that most of his criticisms of Francis are exactly the same as the criticisms that progressive theologians had of Pope John Paul II. While Weinandy believes Francis has betrayed the legacy of John Paul and Benedict, progressive theologians accused John Paul of betraying the documents and spirit of the Second Vatican Council. Progressives too felt that John Paul’s episcopal appointments were disastrous. And they saw scores of their colleagues subjected to inquisitional procedures that Weinandy helped carry out for the bishops and the pope. If a theologian like St. Joseph Sr. Elizabeth Johnson of Fordham University had written a similar letter to John Paul, the Vatican and the bishops would have come down on her like a ton of bricks. Weinandy, on the other hand, got a slap on the wrist from the president of the National Conference of Catholic Bishops and lost his position as a consultant to the bishops’ Committee on Doctrine. In his statement, Cardinal Daniel DiNardo noted that “Throughout the history of the Church, ministers, theologians and the laity all have debated and have held personal opinions on a variety of theological and pastoral issues.” But, he said, “every good Christian ought to be more eager to put a good interpretation on a neighbor’s statement than to condemn it.” And, “This presupposition should be afforded all the more to the teaching of Our Holy Father,” DiNardo said. I don’t disagree with anything DiNardo said, I just wish dissenters had been treated similarly during the papacies of John Paul and Benedict. Yesterday’s papal loyalists are today’s dissidents. Yesterday’s dissenters are today’s papal defenders. The true scandal in the church is not what one theologian or pope says, it is that we are not capable of dialoguing with each other. That is the fault of John Paul and Benedict, not Francis. They attempted to impose their theologies (their way of explaining the faith) on the church and silenced anyone who disagreed. With the papacy of Francis, we are being invited to dialogue in a truly collegial fashion. Why does that scare people like Weinandy? Because they can no longer impose their views on the church. They are no longer in charge. Categorías: Teólogo, Teología | Tags: Papa Francisco, Thomas Reese | Enlace permanente. Mons. Víctor Manuel Fernandez, considerado como el teólogo del Papa ha concedido una interensante entrevista en la que habla sobre sí mismo y sobre el Papa. Es muy recomendable. Categorías: Sin categoría, Teólogo | Tags: Víctor Manuel Fernández | Enlace permanente.